The big event every summer in the Portes du Soleil is the PassPortes du Soleil. An annual event that showcases the fantastic mountain biking on offer in the area as all the resorts (Les Gets, Morzine, Avoriaz, Chatel, Morgins, Le Crosets, Champery and Torgon) open their lifts and the whole area becomes accessible from the end of June to the middle of September. 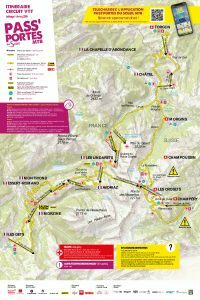 The Passportes route uses 16 of the 24 available summer lifts in the Portes du Soleil and covers 80km through France and Switzerland. The route takes you down 6000m of decent with just 1000m of climbing. Using the chair lifts to take out a lot of the hard work and get you to the top in no time. The Passportes route is set up to showcase the best tracks and views the area has to offer and it is a truly stunning ride. There are eight refreshment stops along the way with drinks (even beer), snacks, meals and entertainment making the whole day not just a great mountain bike ride but a fantastic experience with a great atmosphere. It is a fantastic day out for all levels of biker. For the more experienced right through to the more steady rider who enjoys the scenery, atmosphere and a more sedate pace of mountain biking! To complete the whole circuit takes a good level of fitness and determination, but with the emphasis being on a fun day out, you’re guaranteed to want to come back again next year. The 2019 Passportes du Soleil mountain biking event will take place on the 28th June to 30th June 2019. This will be the 16th Edition of the event and its popularity just keeps growing from year to year. The 2018 Passportes du Soleil saw over 8000+ riders taking part with over 2500 tickets being sold in the first 20 minutes of them being available. If you want to take part in the 2019 Pass’Portes du Soleil then contact us now as places sell fast! You can either book to stay with us and we can sort out your entry, or you can apply online through the Passportes du Soleil website. We have put together various holiday packages depending on the length of time you would like to spend in the area before and after the event. Free Entry into the Passportes Event on your day of choice (we will book your entry for you saving you the hassle)! – Your entry includes a lift lift pass on the day of the event, a gift (normally a T-shirt or bag) and a free day lift pass for your next visit. 8 food & drink stops on the day of the event (includes free beer)! Launched in 2017 the EPASS’PORTES offer a course specifically designed for electric Mountain Bikes. You will ride around the Portes du Soleil on trails offering amazing scenery and some technical climbing (made easier by the fact you are on an electric bike). There are 2 recharging stations available at the main food and drink stops. The Kids Pass’Portes is for kids aged between 9 years old to 14 years old. They set off as a group accompanied by qualified Mountain Biking instructors. They have their own course designed to be easier and more suitable for young riders. The aim is for the kids to have fun and experience the amazing mountain biking in the Portes du Soleil. This is normally offered in the host village. Mountain Bike guides will provide special bike lights and take you on a two hour adventure trek. Enjoy a day hiking around the Portes du Soleil on foot whilst taking in the amazing scenery and landscapes. The hikes normally last between 3 to 4 hours with food stops on the route. You can start from a choice of 5 locations with other like minded walkers.